This book contains seven stand-alone adventures for use in any campaign, or in the Lost Lands campaign setting. From the ghostly terrors of Ectarlin’s Last Ride to the fey-filled journey of Illusion and Illumination, these adventures provide you with a wide variety of challenges to puzzle and threaten the characters. Nothing is as it seems, and dangers lie around every corner! The Borderland Provinces “campaign” is designed for characters who like to travel across wide regions, and Game Masters who like to run such “sandbox” campaigns. There are upsides and downsides to running a sandbox campaign rather than one where the characters are presented with a series of clear objectives, all of them roughly designed for the character’s current level of experience. A sandbox campaign like the Borderland Provinces requires that the players are able to identify objectives for themselves, or else they may become paralyzed with indecision, looking for the “right” place to go. So, on the Game Master’s side of the GM screen, it’s very important that the characters are presented with lots of choices wherever they go. This - as any experienced Game Master will immediately note - makes a lot of work for the Game Master. How do you generate those choices? Do you need to prepare five or six different adventures for each time the characters enter a tavern and start asking questions? This book is a resource for generating journeys, but in doing so it allows you to fill the world with a realistic jumble of objectives, possibilities, opportunities, and motivations for the characters, keeping them from asking, “Well, what are we supposed to do?” It might take them a bit of practice to switch into the “sandbox” mentality, but soon they will be asking, “Which opportunity do we want to take?” And that brings us to the reason for this book, because at that point they’re going to need lots of options, and it’s your job to produce those options. So we get to the well-known fact about running a sandbox campaign. It’s not necessarily more work for the Game Master, but it requires much more improvisation and thinking on your feet than a programmed adventure path does. It’s a method used more by experienced Game Masters for this reason, and there are actually some groups of players who feel like it’s too unfocused. However, for those who like the feeling of forging their own destinies in a living world, the sandbox style of play in unparalleled. The Lost Lands: Borderland Provinces is designed for that difficult but highly-rewarding type of Game Mastery, and this book is a tool for handling the “journeying” part of a sandbox. These are lands where the great tide of an empire is drawing back, leaving its old provinces to fend for themselves but still trying to hold its ancient grip upon them. Unlike the Sundered Kingdoms to the east, the Borderland Provinces are not plunged into chaos - at least, not yet. Listen. For it whispers on all sides, like the sounding of water upon the rocks. Watch. For it leaves its mark upon the face of the waters. Consider. For there is much hidden below the quiet of still surfaces. Prepare. For the tide of civilization stirs itself, and moves. - Interpretation of the oracle of the teeth of the dead, conducted by the Priests of Jamboor in the Great Reliquary, in accordance with the Twenty-seventh Cipher of the god, in the year 3509 of the Imperial Record. 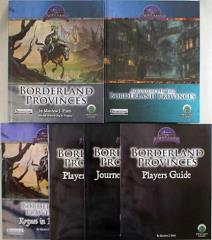 The Borderland Provinces Player's Guide is an introduction to Frog God Games’ Borderlands through the words of its inhabitants. Rogues in Remballo is a city adventure set in Frog God Games' Lost Lands campaign world. As an introduction to adventuring in the Borderland Provinces, the City of Remballo immediately gets first-level characters embroiled in strange plots, sinister intrigue, and fierce battles. Is the thieves’ guild of Manas encroaching on the territory of the Remballo guild? What is hidden in the sanctuary-courtyard known as the Four Corners? How is the powerful banking house of Borgandy involved with all of it? What starts as a straightforward mission actually involves a host of complications some of which can be deadly if the characters don’t play their cards right. This is a limited "Collector's Edition" printing of the module Rogues in Remballo, an introduction to the borderland Provinces of the Lost Lands, for first level characters. It was made available to backers of the Borderland Provinces Kickstarter in 2015. Enjoy!